Oh look it's me. Well the blog hasn't had any photos of me for a long time, if ever. Andy and I went to Louisville, KY on Sunday the 11th. 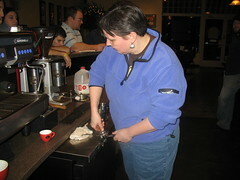 We took part in a barista Throwdown! at La Vida Java. This throwdown consists of making a latte with free poured art on top. Now, I am not the greatest at this feat, but I do like to try. More than anything I like hanging out with other coffee people. I learn something every time I get together with others in the business. So, come on in and see if our latte art is any better. I think it is.